Uptown™ is a high-low looped pile entrance mat that provides functionality for drying and retaining moisture and debris, while offering an upscale, elegant look. Its 40 ounces of tufted Decalon® yarn per square yard offer the ultimate in moisture absorption and crush resistance standing up to the heaviest traffic areas. Uptown™ has a heavyweight vinyl backing available in corresponding colors to ensure minimum mat movement and enhance the aesthetic appeal of the mat. 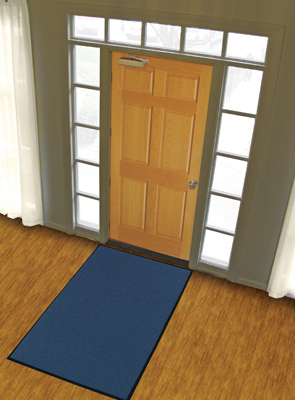 Uptown's colors correspond with the Boulevard™ mat to be used together as an upscale scrape and dry entrance mat system. The high-low looped pile design offers functionality and aesthetic appeal. Densely tufted Decalon® yarn provides the ultimate in moisture absorption and crush resistance. Heavyweight vinyl backing available in corresponding colors ensures minimum movement while maintaining an upscale look.